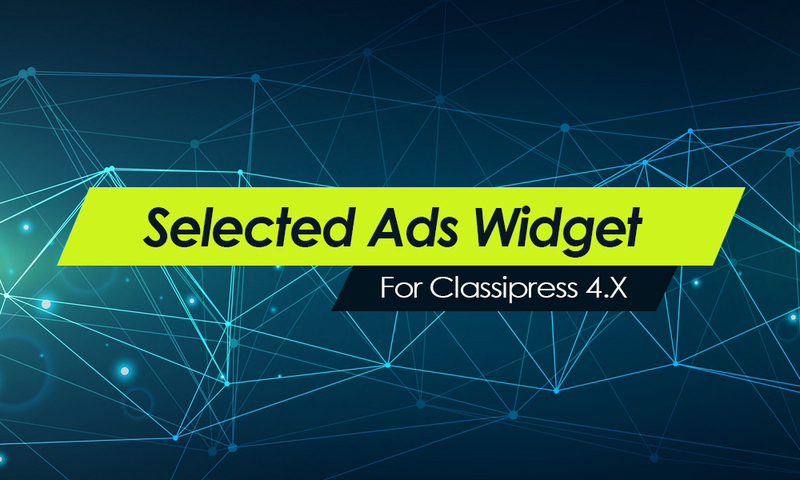 Do you want to turn your Classified ads website into an ecommerce Site with all the features of Classipress 4.X ?? 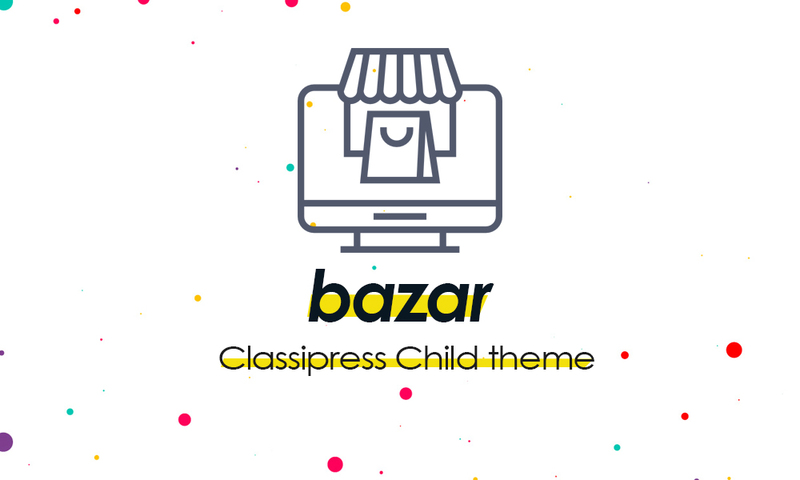 Bazar is a fresh and clean, modern and functional, versatile and sophisticated, readily responsive Child theme for Classipress 4.x. 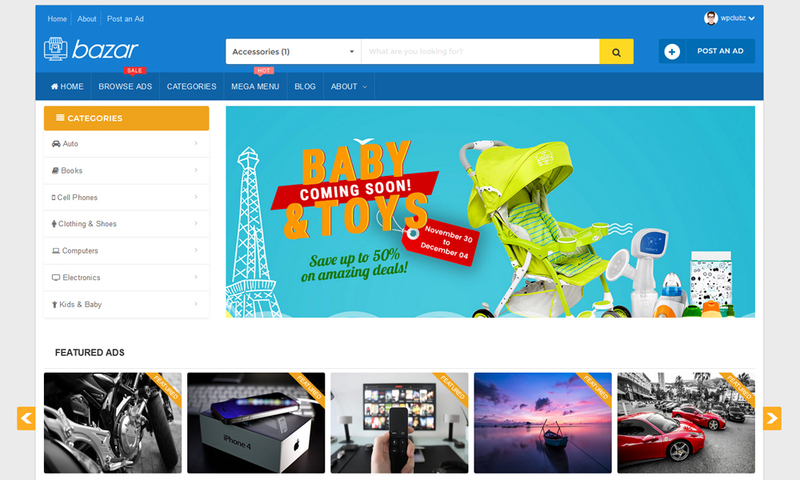 A true eye-catcher and business maker, Bazar comes with all the features needed to run a powerful classified ads website, It’s not just like any other theme. More demos and Video Screencasts are being prepared. Unlimited colors: With the built-in color pickers in Bazar theme options you can change the color of nearly every element of your website. Wide/Boxed Layout: Choose between boxed and wide layout. 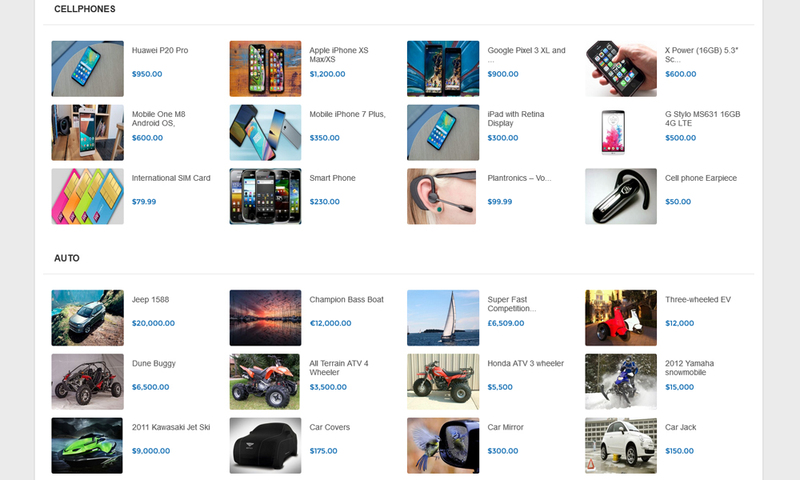 Responsive Ready: Bazar is fully responsive. it’s compatible on all new & latest browsers tablets and mobile devices. 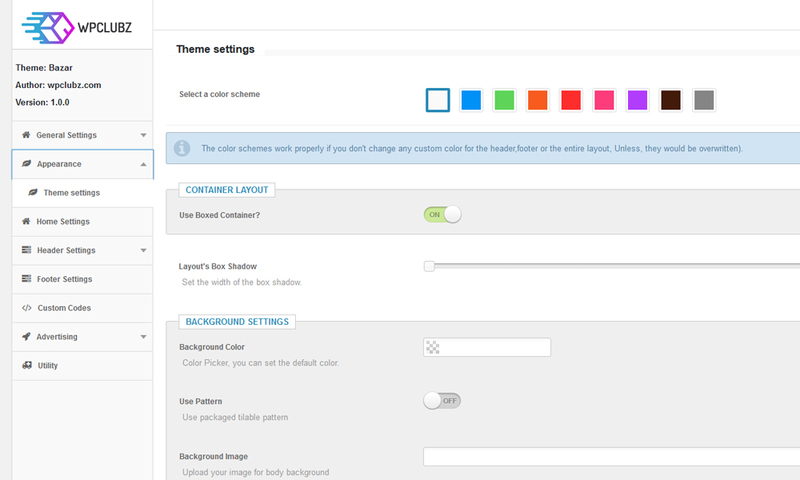 Powerful Theme Options: Bazar theme options panel allows users to customize the theme in an easy and simple way. Click-Click-Done .There’s no code knowledge required. 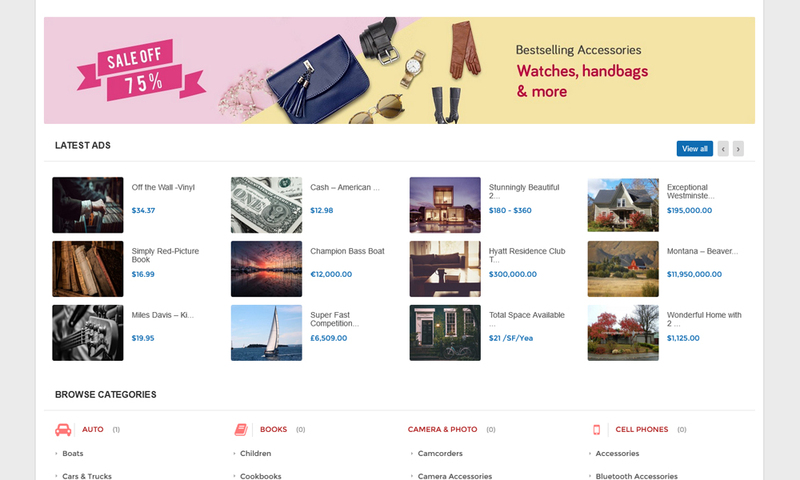 Easy Customization: What you need to create amazing coupon listings websites with no coding knowledge, Bazar comes with the multiple options panel. RTL Ready : Works properly on RTL languages such as Arabic. 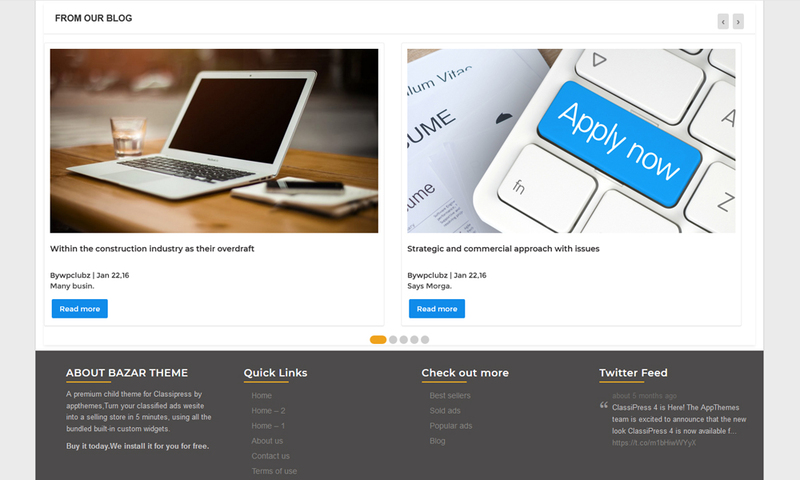 Advertising ready: Inject the website with advertising on the header and the footer, all options. SEO ready: h1,h2 and h3 titles, images titles and tags , Bazar was built with following the best SEO practices to help for best ranking in search engine for your website compatibility. 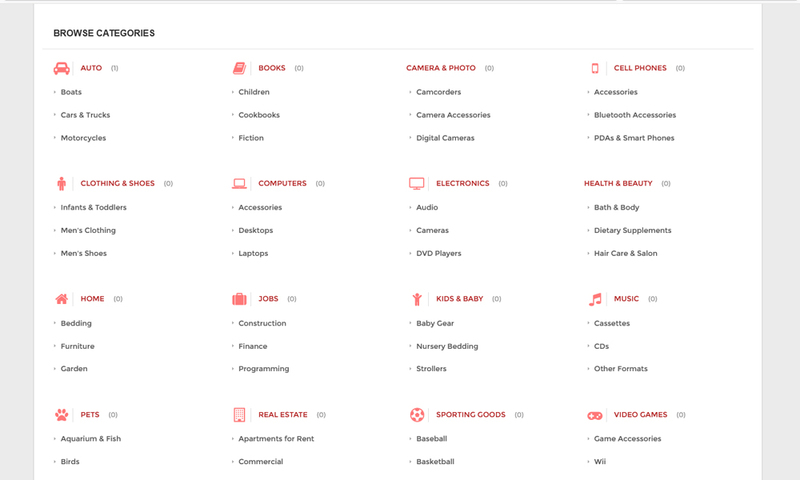 The home page has its own customized parts and functions. 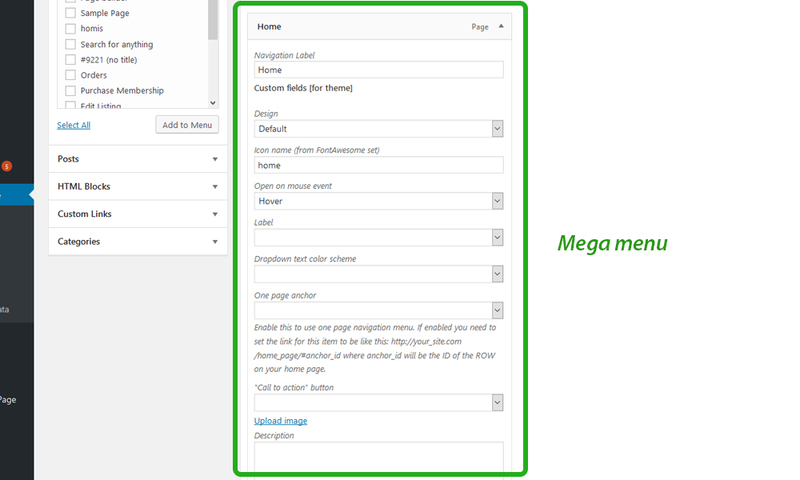 Categories Mega Sidebar with icons (You can customize the icons, drop down list, colors,..). 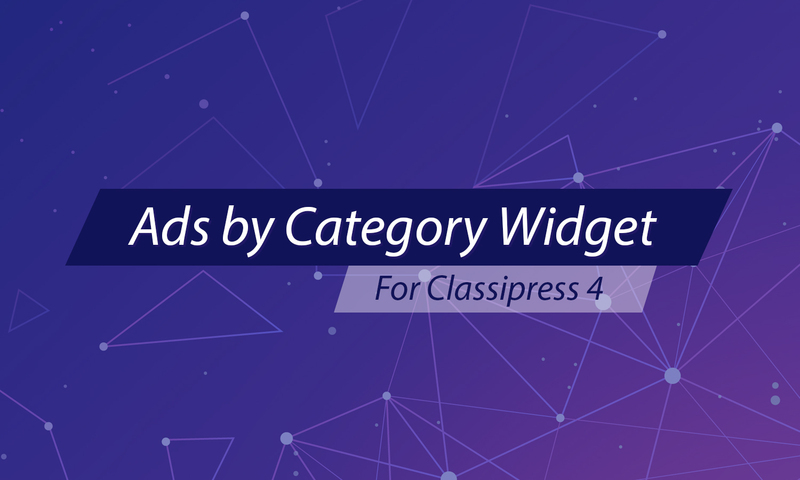 Blog posts: Unlike Classipress’ widget, Bazar’s one comes with lot of options. Tabbed widgets: Select any defined widgets to be displayed on the tabs.Add as many tabs as you want. Search bar settings: Select the categories to show on the search box. 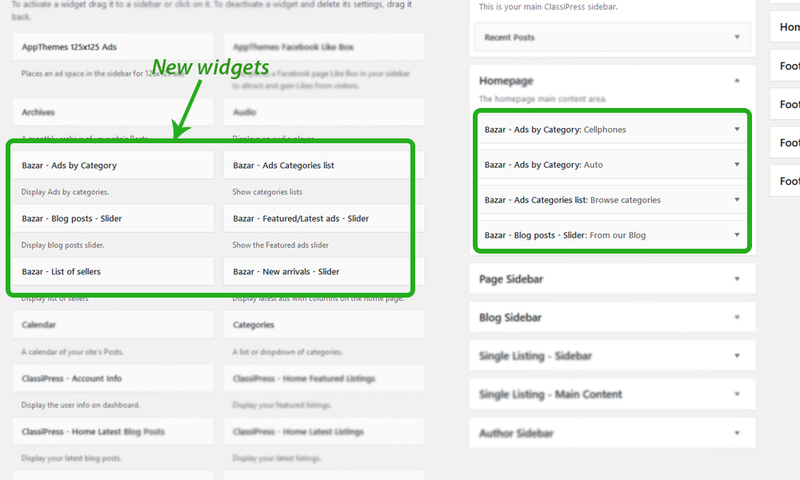 Widgetized footer ( you are able to set the width of the widgets on the footer, or disable them). Footer background colors and image. Your Bazar now is installed and ready for use. Will we have a son theme for the vantage? We just wait for appthemes team to make it live. I bought you child theme. I have a problem with Child categories list. Thank you for buying our theme. I see the issue on the screenshot, and to encounter the same bug, tell me please. -does the first category has any child cats?? if you can send a temporary admin access by email, so I can debug it and fix it immediately. if there is a bug in our theme or a misfunctional code, we will fix it and include it on a prompt update. there was a little bug indeed. when the first category has no child categories. Download the theme again, it’s fixed now. Ok it work great. 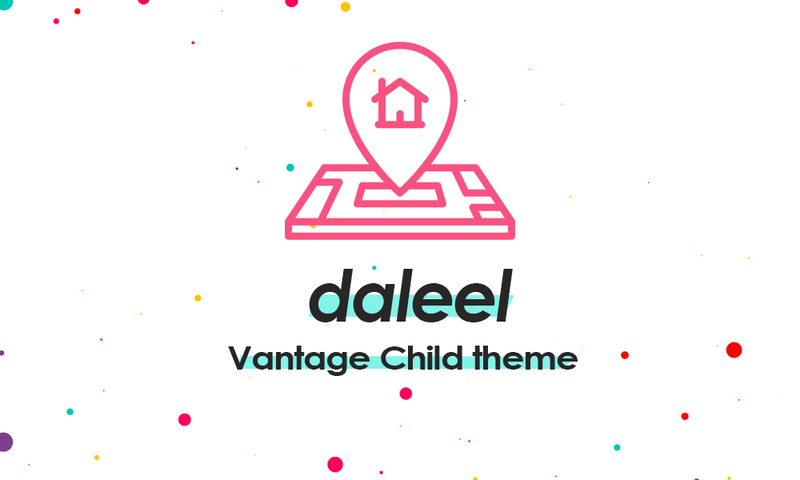 It’s Very good theme child. I am glad you like it and gladder that the issue was fixed. The theme don’t show the Go button when you need to ad ads. The theme don’t show Exactly the number of ads in the category as they are in Classipress. Try to fix this bug, thanks. can you please send the url so I can debug the issue you mentioned ( the go button) ? Technically the submit button is a part of classipress, we didn’t add any function or code that should affect it. and the go button shows when you select the categories and subs. also where is exactly the number that should show? which part? it would be great if you take screenshots or share the url. Yes It is but its works in the Classipress when I chance the theme. I am going to create an account and see that. could you please send a test account username/password? if you assign me to an admin access, I can simply and in 5 minutes make it looks like the demo and show you how to do it. 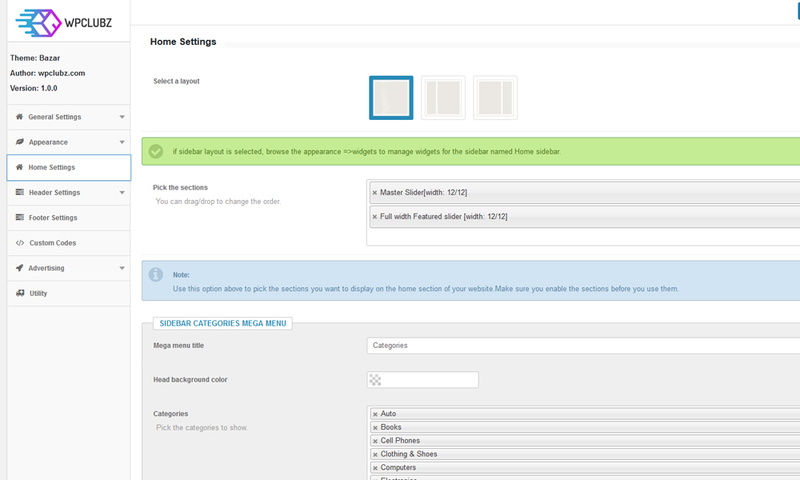 I found a little conflict between a plugin advanced fields and Bazar theme. I am going to debug that and make a quick fix . after deactivating the plugin it does. 1. How does Bazzar works with WPML? 2. Tell me more about icons you used, can I use my custom svg icons? 1- Bazar works seamlessly with wpml and loco plugins as well. 2- The icons we used are loaded frrom a third party plugin (taxonomy icons) + we have an option for images that you upload for each category, I believe there is a way to replace the plugin’s ones and put yours easily. our theme will still work with any other third party plugins that maybe you can upload svg icons manually from your computer. Your theme child is awesome but i have a problem. I am use Loco Translate plugin. In Bazar theme , we have made its separated language file. You can translate the strings by using a third part plugin named Loco https://wordpress.org/plugins/loco-translate/ , once you activate it, translate the strings right from the dashboard. For the Meta tag on the title, I am going to check that out and fix it if there is anything wrong with our codes. Once it’s fixed, You’ll receive it as a new update. I have only one more problem with 2 strings translate. But All Categories strings with search bar is not work to translate Loco Translate and CSS. I translated this strings Classipress and Bazar childtheme and translated with code php parts/nav-top-search-bar.php and still not to translate. It’s a css trick but you won’t need it. give me 5 secs, I will check out the files and make these two words translatable. Ok its fine. I translate this strings with nav-top-search-bar.php. I have updated the language file, You can redownload it again.it’s better than editing files , so when you update next time, You’ll lose all these changes. Hello! Please! I do not have the drag/drop option to change to order. can you please show me the link that you are referring to ? which drag drop one? the widget or the appearance one? Perfect, I am happy to hear that, Claudio. please when you get a good experience with the theme or its support, don’t hesitate to rate it and leave a review for it. We never ask for this but since we are still new here,we want our first clients to pass their experience with us to the others. Hi wpclubz, , I bought the Classipress theme, but I do not know how to configure it. My question is this: If I buy the Bazaar child theme, it comes configured by default, that is, it comes as a template as seen in the Demo, to only replace things. Can you please let me know when you will be able to configure my site to look like your demo, as I have now been waiting 2 days. If you can give me an idea of timescales that would be great. Also, just out of interest if I need help or support on your theme, how soon would I normally get a response and some help, as I am working to a tight deadline and waiting a few days for a response would greatly delay me. I have sent you the login details to my site, so you can configure it. I am sorry, I think there was a misunderstanding from my part.I thought you were still asking for custom mods to be done. what should we do now? I see you did lot of work adding your own categories?? 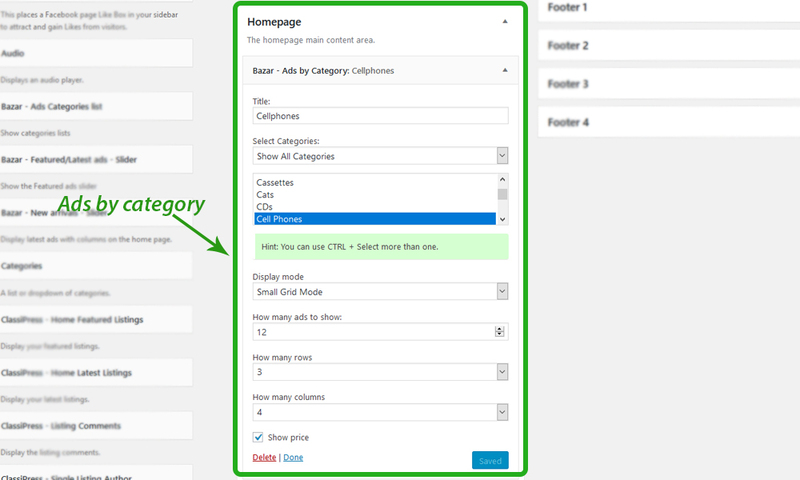 I suggest something, I configure the site like the demo without adding the ads, which means the site will empty for you but with all the widgets enabled on the home page, and once you add ads they will go to their place and the site will be looking like demo. what do you say about this ? Yes for now, please just set the site up like the demo and leave out the Demo Ads, as you said, once the site begins being populated the Ads will start falling into place. I still haven’t got a logo as yet, once I get one I will pass it on, I still have to find someone to design one. Yes, I received your emails, I have just replied to your email, please take a look. I have checked and the site is almost like the demo, but it is missing the side category menu and also the sliding image under the banner. I have attached a screenshot of what I am referring to to an email I sent to you. Just wanted to know when you will be completing the process of making it look like your demo? I worked on it early on the morning.It’s almost like the demo, only need to reupload the images for the ads. Just out of interest I assume I can change the section below the header to one of your other demos, like full width image? 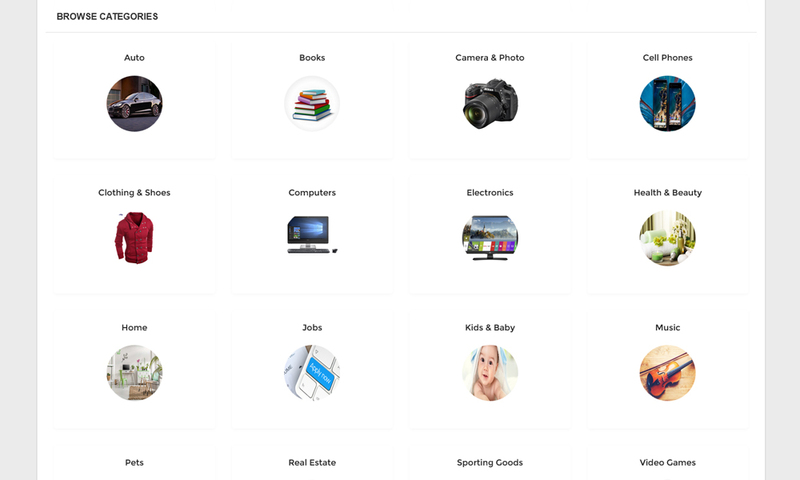 Alright,it’s almost the same, I am going to add the banner bellow the categories and the ads by category widget. and Yes You can add a full big banner under the header, there is a widget for that. OK, that’s fine. Just let me know when you are done. Also, please check your email I sent you. I have had a look at the site now, it is pretty close to the demo, I see that there is a Ad banner missing on my site compared to your demo, I have sent you an email with an attachment, I have also sent you another email asking another question, please have a read and get back to me. Thanks. For the banner, I am going to add it and show you how to do it yourself, actually it’s a widget, nothing too techy. let’s keep conversations by email then. That’s fine we can communicate via email. So long as I get a speedy response I don’t mind which communication channel we use.